As a motorist what’s the last thing you expect to see running right in front of you on a busy motorway? An alien mothership? Perhaps a herd of running bulls? Or is it a beach ball? How about some bloke who seems blissfully unaware he’s inches away from being turned into a pancake by a semi-trailer truck. That’s exactly what happened when truck driver Adam Rabie was driving along a busy highway in America. The incident occurred on the 94/80 interstate near the Indiana-Illinois state border. Adam was driving down the busy motorway when a man walked into oncoming traffic. As Adam’s vehicle got closer, he was centimetres from hitting the fella. 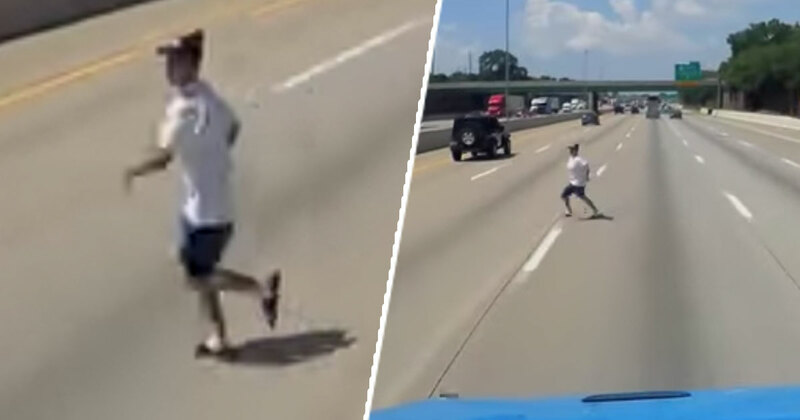 What possessed this man to think walking onto a busy motorway would be a good idea? What was he after? Was he lost? Only he will know why he did what he did. Luckily for Adam though, he managed to avoid running over the man in what would have been his inevitable death. You’ve got to love dash cam footage. As well as providing drivers with perfectly legitimate alibis it provides evidence of the lack of spacial awareness of pedestrians and other motorists. It’s like You’ve Been Framed for the road. Although in some instances some of the gaffs aren’t funny due to the dangerous and life-threatening situations. Last week, Septemeber 7, saw scary footage of a massive lorry getting sliced in half by a freight train, which was caught on camera. The moment was filmed by another driver in Virginia, USA, who came round the corner to see the huge lorry stuck over the tracks with the crossing lights flashing. As the men in the lorry scrambled out and made a run for it, a freight train came by and, like a knife through butter, went straight through it. No explosions, no special effects, just a train going full speed through the middle of a lorry. [I] turned the corner to approach the crossing and found the tractor-trailer stopped on the tracks with the crossing guard down and the lights flashing. As the video shows, the driver of the lorry managed to jump out of the cab just a few seconds before the train hit. After the collision, the front half of the lorry then rolls away from the tracks, surprisingly still intact. The same, however, cannot be said for the back half.